Another amazing Weekly Adoption Shout Out last week with so many of you taking up the challenge of our theme - Education. From feedback it seems that you enjoyed having a theme, and so this is something we hope to continue on a fortnightly basis, but it'll always remain optional. So as a head's up for next week, the theme will be 'Contact'. And we welcome your ideas for future themes too. We're really pleased to be connecting with so many of you on Twitter, and it's great to see so many bloggers supporting each other and engaging with each other. If The Puffin Diaries and I aren't already following you on Twitter, then leave your @username in the comments below and we'll make sure we do. If you have a Facebook page, then you can stop by there and say hi too...The Boy's Behaviour is here, and The Puffin Diaries here. If you're reading, we'd love it (and so would those who've linked up) if you go visit some of the links and leave a comment. 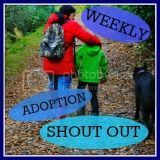 Don't forget to say you found them through the Weekly Adoption Shout Out or #WASO. Tell your Twitter friends if you've had a look too using the hashtag #WASO. So without further ado, Week 7 is now open...jump in, link up and go read some interesting blogs! but you only need to add your details to one. Oh, and there's a badge...everyone likes a nice sparkly badge don't they? If you need help with adding it to your own site, then just ask! A typical Adoptive Parent - Theres no such thing. What does support look like. Great work on the WASO, such a simple but brilliant idea. Keep it going!